Disasters, both natural and man-made have left devastating impacts across the world. Recent history reminds us of several significant natural disasters that have adversely affected many communities and left them reeling for months and years. A few examples include Superstorm Sandy (New York and New Jersey), several tornadoes (communities throughout the Midwest) and Hurricane Katrina (the Gulf Coast). We witnessed the raw strength of these disasters and were left to pick up after the damage was done. Governments at all levels are charged to prepare and react appropriately when they know natural disasters—such as hurricanes, tornadoes, earthquakes—will impact their respective boundaries. No level of preparation can mitigate the damage done to the communities. After the storms dissipate, governmental leaders must act to lead the rebuilding efforts. There are examples of governments that did a great job rebuilding communities after a disaster. However, there are examples of terrible rebuilding efforts. One example of the government reacting poorly before, during and after the disaster was Hurricane Katrina. We can Google myriad terms related to Hurricane Katrina. This search will yield images of children and adults sitting on the rooftops of houses due to the rising water levels. You can find the images of communities destroyed and abandoned because of the damage left after the water subsided. Should we expect or demand that our government leaders have reaction plans in place when these disasters strike? If we expect them to have these plans, should we further expect them to share these plans with the communities so that we can take precautions in advance of the storms as well as beginning the rebuilding process? Should government leaders take proactive steps to share this information with community leaders so they can share these plans with residents? Are these reasonable requests in times of disaster? According to Michael Lindell and Carla Prater in a 2003 Natural Hazards Review article titled “Assessing community impacts of natural disasters,” assessing the community impacts of natural disasters are important for three reasons. First, such information is useful to community leaders after a disaster so they can determine if there is a need for external assistance and, if so, how much. Second, information about disaster impacts can be used to identify speciﬁc segments of the community that have been affected disproportionately (e.g., low-income households, ethnic minorities or certain types of businesses) or might be affected in the future. Third, planners can develop disaster impact projections before disasters strike to assess potential consequences of alternative hazard adjustments. After the storms pass, what level of responsibility and involvement does the government have in rebuilding the community? Do local community groups, churches, nonprofit groups and other members of the community have an obligation to contribute to the rebuilding efforts? Should there be a public-private partnership? The argument can be made for all of the above; however, with just about all of the recent natural disasters we see agencies like The Red Cross and Federal Emergency Management Agency (FEMA) leading the rebuilding efforts within the affected communities. 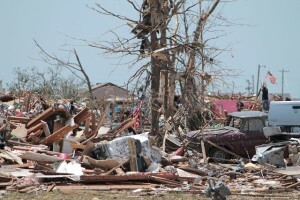 Organizations such as The Red Cross, Habitat for Humanity and other nonprofit groups will take donations and volunteers to help rebuild the communities while the local, state and federal governments will provide other resources such as food, water and temporary shelter to assist in the recovery efforts. FEMA has also provided mobile homes to victims of these natural disasters and they would reimburse local and state agencies for services provided during the rebuilding process. During these terrible times, we see the significant generosities of communities near and far through donations such as food, water, clothing, shelter, and even volunteers to help rebuild the communities. Many businesses will donate supplies and labor to assist in the rebuilding processes as well and many can write-off the donated supplies on their taxes as charitable donations. In the time immediately after the disaster, it is incumbent upon all available members of the community to contribute to the rebuilding process. The community has the best chance to rebuild in the aftermath of a disaster when all available members of the community step in and do their part. Author: Jeffrey R. Zimmerman Ph.D. in Public Policy and Administration from Walden University. He currently serves as the director of processing services within the North Carolina Division of Motor Vehicles and works as an adjunct professor in the MPA program at Strayer University. Email: [email protected]. Post-disaster should not just be about recovery; rather, emphasis should be placed on redevelopment — bringing back a better and stronger community, not just recreating the one that was destroyed. For more on this, read the chapter “The Half-Full Glass” in Jack Pinkowski (ed) book The Disaster Management Handbook. This chapter draws upon lessons learned during the post-Katrina response. Chapter authors — David W Sears and J Norman Reid.